Downy mildew may occur sporadically on some ornamentals, but can be a predictable pest on others. There are many different pathogens that are responsible for the downy mildew diseases and most are restricted to only one or a few plant types. For instance, the downy mildew pathogen that infects roses is specialized and does not cause disease on other ornamentals. Downy mildew can occur on all above-ground plant parts, blighting the leaves and stems. Sometimes the first symptoms of downy mildew are confused with a nutrient deficiency or spray injury. On the leaves, spots may be purplish or brown and appear square since they may be limited by the larger veins. Downy mildew that infects some plants, such as roses, doesn’t always produce a fuzzy mat on the underside of the leaf that is noticeable to the naked eye. On other species such as coleus, sporulation may be observed easily on the underside of an infected leaf. Often, infected leaves drop from the plant, and when the infection is severe enough, may leave the plant nearly devoid of foliage. Once the diseased leaves start dropping, the downy mildew is advanced, and stopping it becomes difficult. Downy mildew is very responsive to weather cues. When the weather favors downy mildew, symptoms can explode almost overnight. Wet weather, high relative humidity, and overcast conditions are triggers to downy mildew disease. 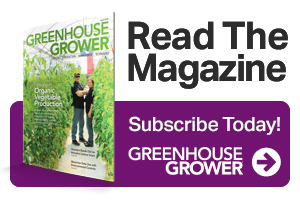 In outdoor growing facilities, fog provides nearly the perfect weather for an outbreak. During wet weather, a fine weft of fungal threads can coat the underside of the leaf. This is where the downy mildew pathogen reproduces via spores called sporangia. They develop and ripen during the night as long as there is darkness and at least six hours of continuous moisture. When the environment begins to dry in the early- to mid-morning hours, the air currents pluck the sporangia from their spore stalks and carry them to nearby healthy foliage. One of the most common mistakes with downy mildew is confusing it with the similarly named pathogen powdery mildew. Powdery mildew-infected foliage will produce white talcum powder-like sporulation on the upper or underside of the leaf. Control methods for powdery mildew will unfortunately not control downy mildew. So it is important to properly diagnose which mildew you are dealing with. Downy mildew was first observed on coleus in New York and Louisiana in 2005, and by 2006 it was found throughout most of the U.S. Symptoms include leaves dropping off plants and brown blotches on leaves. Both seed and vegetatively propagated types are susceptible. The brown or blighted areas on diseased foliage have an irregular shape and can cause the leaf to twist and drop. Over time, the plants can look like palm trees as the plant produces new foliage at the top but there are no lower leaves. The sporangia on the underside of the coleus leaves may be abundant or few in number. It is best to look for these sporangia when the environment is humid and damp. A fungicide study found that although all products tested showed limited downy mildew infection compared to the untreated control, differences were observed among the products. Orvego, FenStop, Stature, and Subdue MAXX were the only treatments that completely prevented infection. 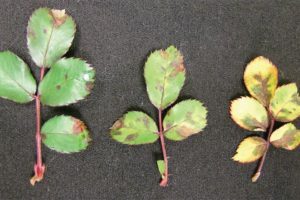 Although Adorn limited infection compared to the untreated control, the number of infected leaves were still at levels unacceptable to growers. 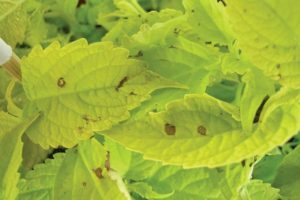 Although it seems that all coleus cultivars may be affected by downy mildew, the amount of blighting and leaf drop that results may vary among the cultivars. Coleus cultivars may also differ in how many sporangia are produced on the leaves. This is important because the sporangia are responsible for the spread of the downy mildew. Wind currents or splashing water dislodge sporangia, making them available to infect nearby healthy plants. In a Michigan State University study, 15 coleus cultivars were compared for leaf blighting and sporangia production. All of the varieties, with the exception of ‘Dragon Black,’ were supplied from the USDA-ARS North Central Regional Plant Introduction Station for testing. Plants were sprayed with the downy mildew pathogen and kept together in a humid research greenhouse. All cultivars developed disease symptoms, although some became more diseased than others. Examples of the coleus cultivars that held up well in our study included: ‘Freckles,’ ‘Beauty,’ ‘W-1977,’ ‘Russet,’ ‘Harlequin,’ and ‘Pegasus.’ Although these showed downy mildew symptoms, the disease was relatively mild. High susceptibility to downy mildew was observed on cultivars ‘Duke Yellow,’ ‘White Gem,’ and ‘Cristata.’ ‘Dragon Black’ was again observed to be very susceptible, and preventive fungicide applications could be needed. In other studies, the varieties ‘Volcano,’ ‘Color Pride,’ ‘Wizard Jade,’ ‘Wizard Mosaic,’ and ‘Festive Dance’ were all determined to be moderately to highly susceptible, as well. We do not know of a variety that is completely resistant to this downy mildew; however, some cultivars appear to be less affected. On roses, downy mildew occurs on all above-ground plant parts, blighting the leaves and canes. Sometimes the first symptoms of downy mildew are confused with a nutrient deficiency or spray injury. Infected leaves turn yellow and drop from the plant. 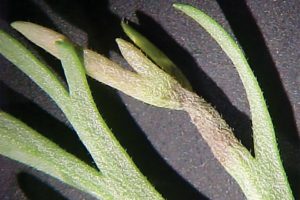 A downy mildew infection may leave the plant nearly devoid of foliage. When the canes become infected, purple spots occur and expand into a blight that affects large sections of the cane. Once the diseased leaves start dropping, the downy mildew is advanced and stopping it becomes very difficult. Fungicide studies were conducted on-site with a commercial nursery. ‘Double Knockout’ roses appeared to have mild downy mildew symptoms when received by the nursery. In Trial 1, all fungicides limited the number of infected leaves compared with the untreated plants. Products that limited downy mildew to five or fewer infected leaves included Daconil WeatherStik, Heritage, and Junction. In Trial 2, Micora was compared alone and in combination with other fungicides. Treatments that limited disease to eight or fewer infected leaves included Micora 8.2 fluid ounces alone or mixed with Heritage or Subdue MAXX. An herbaceous perennial that is infected by downy mildew is spotted deadnettle (Lamium maculatum). Symptoms include lesions that are defined by the leaf veins and yellowing/blighting of leaves. A fungicide study compared different dosages of the new downy mildew fungicide from Syngenta called Segovis with the other fungicides of Micora and Orvego. All treatments effectively limited downy mildew compared to the untreated inoculated plants.